The Community Corner is a place where we highlight people and their work in and around the Blue School community. New features available on Fridays! Dawn virtually needs no introduction. She has been in and around the Blue School practically since its inception. As the Director of Admissions, Dawn Williams welcomes each and every family into the community with exceptional care. Talking about Dawn in her admissions capacity only highlights a fraction of her presence here.Though now a school leader, her relationship to Blue School started as a parent. Her child graduated last year from Blue School’s first 8th grade class. From her vantage point, she has seen the responsive growth and evolution of the school year after year. Five years ago, Dawn was a part of of the first iteration of the Blue School Diversity Committee, then a working group.That Ad hoc group formed in response to conversations that were happening across the school. Through that structure, it became apparent the need for more spaces for conversations around diversity and inclusion. Four years ago, the first pair of teachers were sent to The National SEED [Seeking Educational Equity and Diversity] Professional Development to receive facilitation training. Dawn had the privilege of attending the two-week session this past summer. 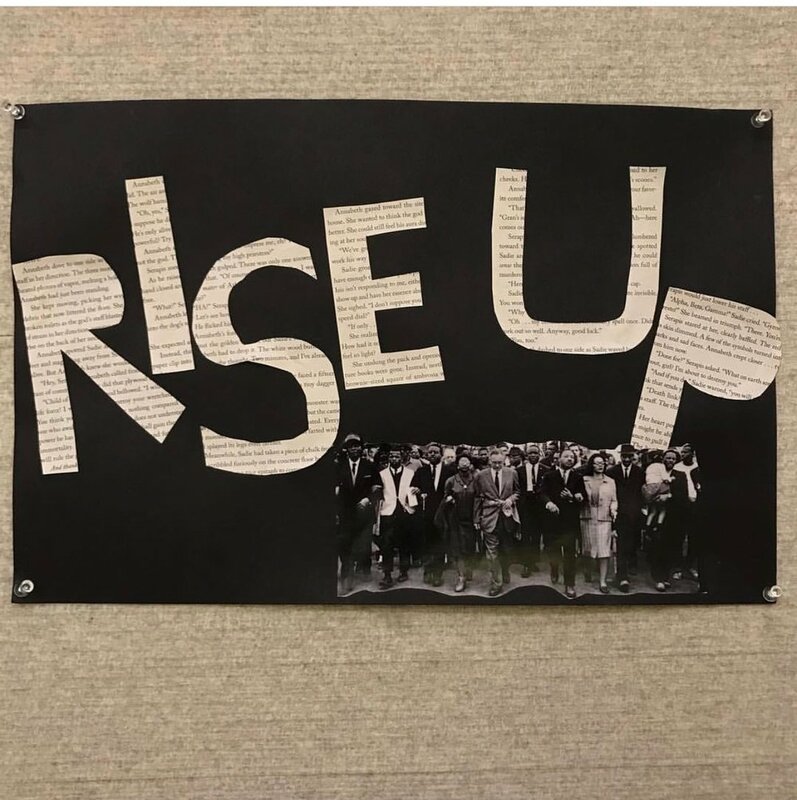 Dawn returned to the Blue School community empowered and prepared, and she has committed to leading this year’s Faculty and Staff SEED group. The 2018-19 cohort has met once a month since October for three hour blocks to read, reflect, and share stories about designated topics. Sessions have broached ageism, ableism, gender identity, racism, social class, as well as the intersectionality of identities. This spring, Dawn will be facilitating a dedicated parent SEED group, which will meet for three full sessions through the end of the school year. The first meeting was April 3rd. The next two meetings are 4/30 and 5/29 from 5:00-8:00 PM. These sessions are open to any parent who is willing and able to commit to the meeting times. As the mother of a child who identifies as non-binary, Dawn felt Blue School was a place where her child could bring their whole identity, and she wants that place for every single family. The Pride Parade became a conscious opportunity for the school community to come together in activism and solidarity. With the leadership of Caroline McAuliffe and many others, the group of participants has swelled each year to include more people than ever. This year’s Pride is shaping up to be the largest yet! Blue School will once again be marching and Dawn and Caroline hope as many of you as possible will join. This will be the third year that Blue School (and Dawn) are participating in the Dalton Diversity to Community Conference. Under the auspice of the Diversity Committee, members from almost every constituent group in the school are represented at the conference. Trustees, administrators, teachers, parents, and students all work in peer groups with other schools and then reconvene as a Blue School group with recommendations. The formal feedback and action plan are documented and then shared with the school’s Diversity Committee. In addition to attending the Dalton Diversity and Community Conference, Dawn has spent the last four years engaged on the NYSAIS Admissions director conference planning committee. With that said, if you are able to, consider joining the parent SEED group for the remaining two meetings. Be on the lookout for the emails about the June Pride Parade and more updates from the Diversity Committee. This Community Corner is a double header, featuring both Maggie and Lyrica! Museums are chock full of just that -- stories about how and why items have been preserved. All those artifacts stand to teach us. Maggie Stein never really thought of any career other than being a teacher. 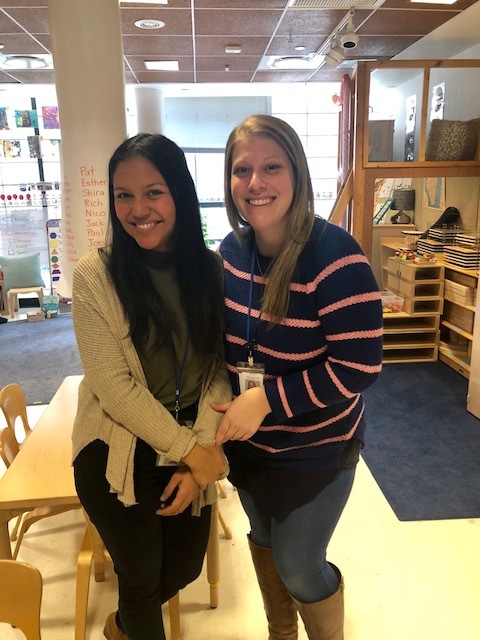 Maggie, who is in her first year here at Blue School, is a part of a dynamic team working with Rebecca and the 3rd Grade. Pictured: Maggie playing chess with students. Maggie has a special knack for museums and all things NYC. She completed a Masters in Museum Education from Bank Street. As an undergraduate, she designed a major in Folklore. Folklore, by its very definition, is about storytelling. It’s a part of the reason she pursued Museum Education. Blue School teacher Sarah Konowitz encouraged her to apply and informed her of the teaching opportunities. Yes, the rest was ‘history’. Maggie has found community in Blue School, both from peers and in the educational philosophy. True to her roots, some of her favorite museums include the Museum of Natural History, with a special shout out to the T-Rex fossil, and the Whitney Museum. Among other things, Maggie is a coin collector. Her collection includes just about every U.S. coin from the 1950’s to present -- except for the all elusive 2009 nickel. Due to the 2008 recession, production of the nickel in 2009 was reduced. Who knew?! Keep an eye out for both Maggie on the 6th Floor of 241 Water, and the special 2009 nickel to help complete her collection! Pictured: Lyrica with 1st A. Her name is Lyrica, and yes, she likes to sing -- karaoke! Originally from Santa Cruz, California, Lyrica Levin made her way east for graduate school. Since moving to Brooklyn seven years ago, she has made New York her home. Lyrica comes to Blue School from the Reggio Emilia inspired Washington Market School. It was there where she developed her passion for education. 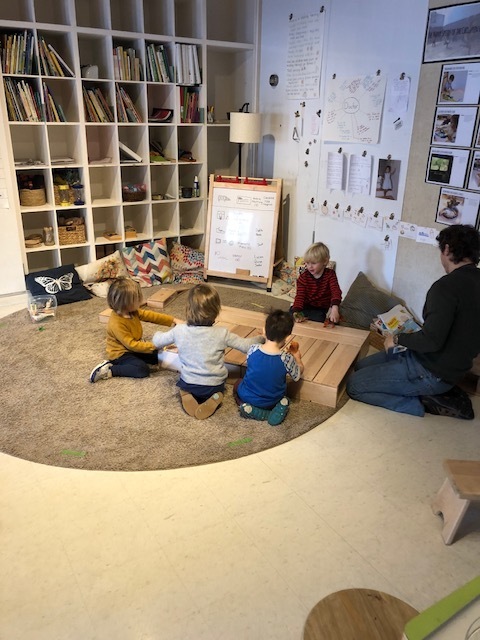 After spending the last 6 years in the early childhood space, Lyrica has now taken on various roles with a range of students here at Blue School. For her, it has been remarkable seeing the skill development and maturity, as well as the nuanced similarities, in age groups. Lyrica first heard about Blue School through Brandi, who has also come from the TriBeCa based school. She feels a strong sense of joy around learning and an affinity to the school. Her love for children radiates. You might have seen a new face (hers!) most recently working in the 2nd grade classroom in support of Michelle’s family leave. Lyrica is now back with 1st grade during Brandi’s leave. Lyrica expressed gratitude for working with Simone, Sarah and all of the teachers whose path she crosses. Thank you, Maggie and Lyrica! Do you know those people who seem to have a one-degree of separation from just about everyone in the city? That feels true of Marian Toy. Born in Queens and raised in New Jersey, she has made the city her home since the 80’s. This school year she has become an ever-smiling morning face in the 156 William Street Lobby. She would tell you that she has lived through some incredible times in the city, the tragedies and the triumphs. Marian can even trace her lineage in NYC as far back as 1899 in the Lower East Side tenements, Ellis Island and Chinatown. Marian worked for the now defunct People Express Airlines in the mid 1980’s, doing almost every job possible. From being head flight attendant to baggage handling to recruiting and training. That experience literally brought her around the world. 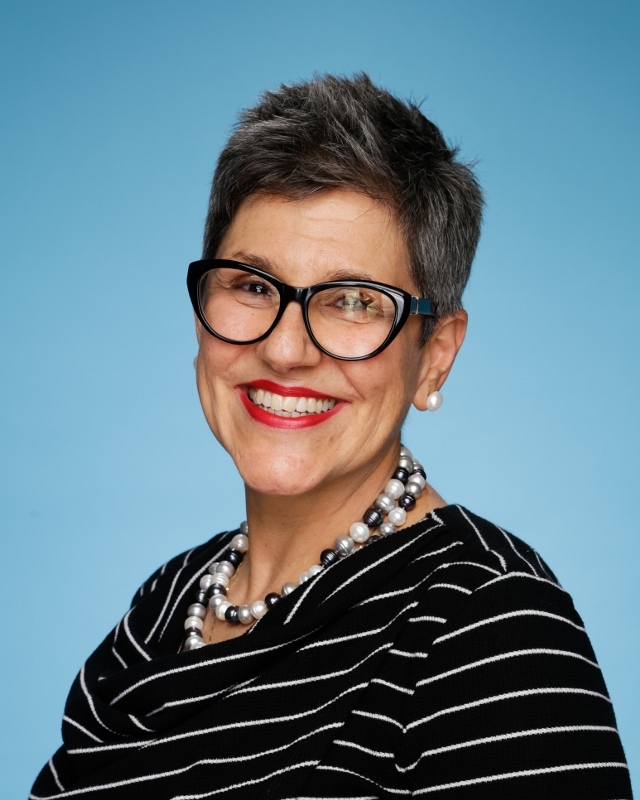 Once back in NYC, she moved on to ventures on Wall Street, taking a class with Betty Friedan during her time at NYU Stern, and eventually becoming a full time parent and caregiver. Marian raised her two children and was simultaneously involved as a parent volunteer for Grace Church School. Over the years she would also serve as a substitute in various departments supporting the school. It’s pretty to safe to say that Marian has done just about a little bit of everything! After 20 years in the Grace School community she thought it was the right time to move on to her next adventure. In typical Marian fashion, on one of her first days at Blue School, she saw Tammy [2s teacher] who she had known from many years back when Tammy worked at a restaurant she frequented. That’s Marian, always make connections and recalling a face! This knack has led her in a short time to become a fixture at 156 William. Be sure to say hello when you see her! Benjamin and Princess Backpack (though she wasn't available for comment!) will have an exciting show this Sunday at the Jalopy Theatre. Benjamin Weiner described his teaching partner, Princess Backpack, as having a bit of a Mrs. Doubtfire attitude which helps create the dramatic element. 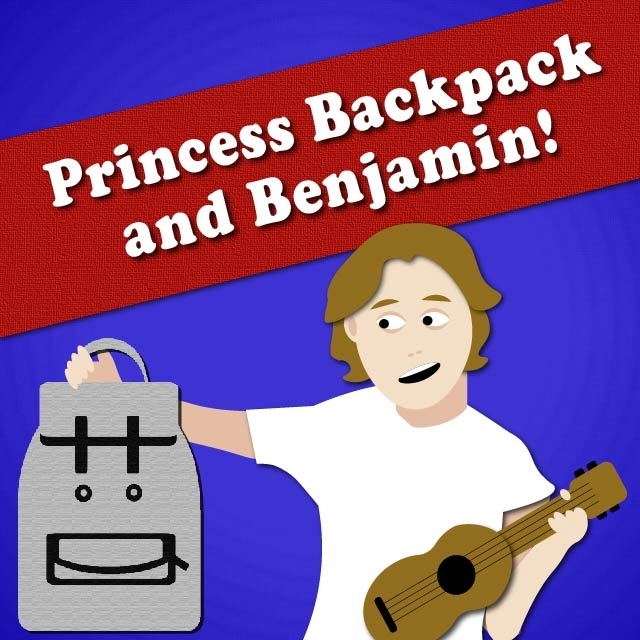 Both Benjamin and the magical Princess Backpack make weekly appearances in the 3s and 4s classrooms. Benjamin has been working with Blue School for three years. For those who haven’t seen it in action, Princess Backpack is Benjamin’s everyday knapsack. While teaching at Saint Ann’s School, he realized that his ordinary bookbag could be a puppet character. It was in that moment that Princess Backpack came to life. Benjamin has the uncanny ability to use found materials to make an instantaneous show. For the littlest Blue Schoolers, magic and imaginative play are real and special. Over the years Benjamin has expanded the act to include accompanying singalong songs. The catchy tunes have received airplay as far away as Australia. That’s right, Princess Backpack has gone global. The duo is streaming on Spotify, Apple music, and Amazon. They also have a CD, if you like to keep it old school. You can’t help but move and groove along to classics like ‘Brother to Pizza’ or ‘We are Pandas’. Besides his work in the children theatre space, Benjamin has credits that include film scores for commercials and book trailers. With a background in theatre, he writes, sings, composes, teachers and plays music. Phew!! Don’t miss the chance to see Benjamin in his Red Hook Brooklyn Performance at 11 am! On Monday, January 21, Blue School will be closed in honor of Dr. Martin Luther King, Jr. Day. Despite the usual temptation of a long three-day weekend, this one is a little different. Many people around the country will spend Monday as a day of service. Dr. King is best known for his civil rights work, but moreover was a man of service in every sense of the word. Dr. King’s final speech on April 3, 1968, the night before he was assassinated in Memphis, was a rally cry for people to continue to work and agitate with or without him. His leadership and example are invoked daily in the ongoing struggles for equality. Blue School has its own tradition of hosting an Oratorical Festival (this year held on January 18th) to celebrate his life work and words, as well as those of other prominent voices. Spearheaded by Amy Zolla and Carrie Klein, students prepared pieces that they delivered to a rapt, standing room only audience. The energy was palpable. Upper-primary and Middle School students take part in this annual presentation - now in its 4th year! The current 8th grade class was the pioneering class, and in many ways, this will be a part of their lasting legacy. 8th grader Beatrice closed out the morning by reciting an excerpt of My Shot from Hamilton: An American Musical. She dedicated the recitation to Carrie for “taking a shot” on the class and letting them lead the festival. Students recited works from the likes of Nikki Giovanni, Maya Angelou and other contemporaries like Emma Watson and Tupac Shakur. Andra Day’s Rise up billowed through the room. Looking around, you would be hard-pressed to find a dry eye. The essence of the Oratorical Festival runs deeper than the speeches delivered. The words from the students left an impression on all those who were in attendance. Hopefully, it was also a call to action. In the spirit of Dr. King, we can all do something to be of service. Let us rise to the occasion. Before they ever become places that children can enjoy, playgrounds start as ideas. Behind each site are architects and designers who have a vision for the utilization of the space. 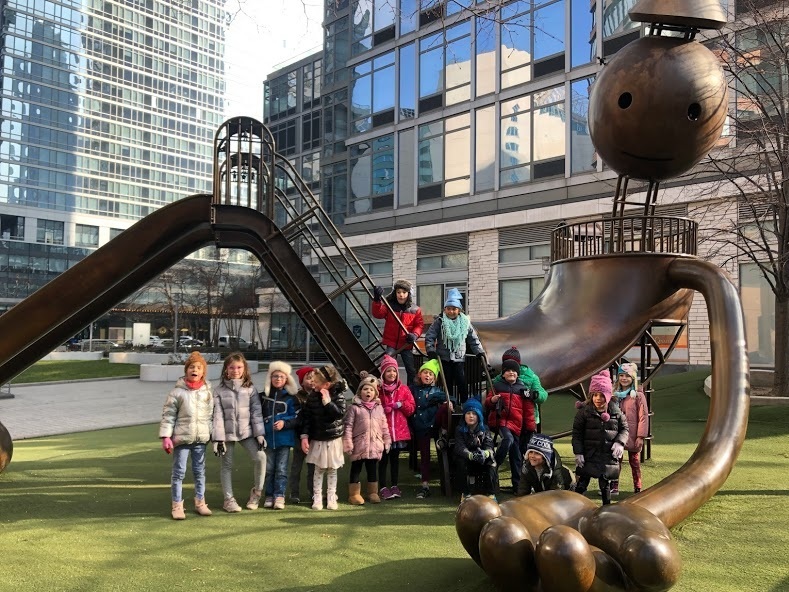 1st Grade B has gone deep into research, recording, interviewing and, of course, doing serious playing to explore some of the most elaborate city playgrounds. The class has been accessing playgrounds both for their design attributes and safety features. Emily Zak and Lissy Rosner have worked together and called on some special friends to help students get a chance to interview people who make playgrounds possible. Influenced by the book, Classroom Interviews: A World of Learning by teacher Paula Rogovin, Emily and Lissy use the interviews as an engagement tool. They say, “Giving students the opportunity to conduct classroom interviews brings research to life. Interviews spark interactive learning, as the interviews are guided and conducted by the students. The goal is for students to guide their inquiry, to ask questions and seek answers. Children are natural researchers, asking questions to make sense of what they see. Presenting the opportunities for classroom interviews, gives children a more formal experience in with what they already do organically. One of the most important part of the process has been for students to be able to enlarge their perspective by conducting the interviews. Students are learning about the experiences of people from all walks of life while practicing note-taking and investigating. The last step has been to transpose the information more creatively ie. making murals, sculptures, models, drawings. 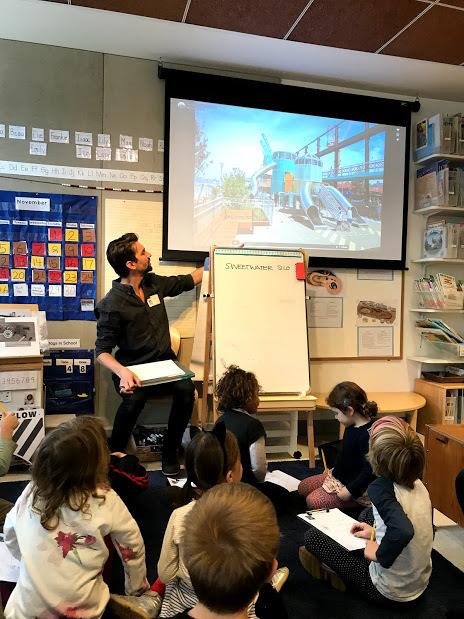 1st B has used their skills at Playgrounds close to school like Imagination Playground, interviewing Cas Holman (designer of the blue blocks), beloved Glenn Echevarria (playground attendant) and Michael Fischer & Shannon Farrell (architects from Rockwell Group.) They have also taken their talents on the road, interviewing designers and experts at innovative playgrounds around the city such as Domino Park’s (Williamsburg) Mark Reigelman (designer) and Tom Otterness’ Silver Towers Playground (Hell’s Kitchen) safety expert Teri Hendy. How long did it take to design the playground? What materials are the structures made out of? Where did you get your supplies to make the structures? Do you work with other people or by yourself? How did you come up with the idea of ____? Did you sketch pictures beforehand? What are some rules for playground safety? 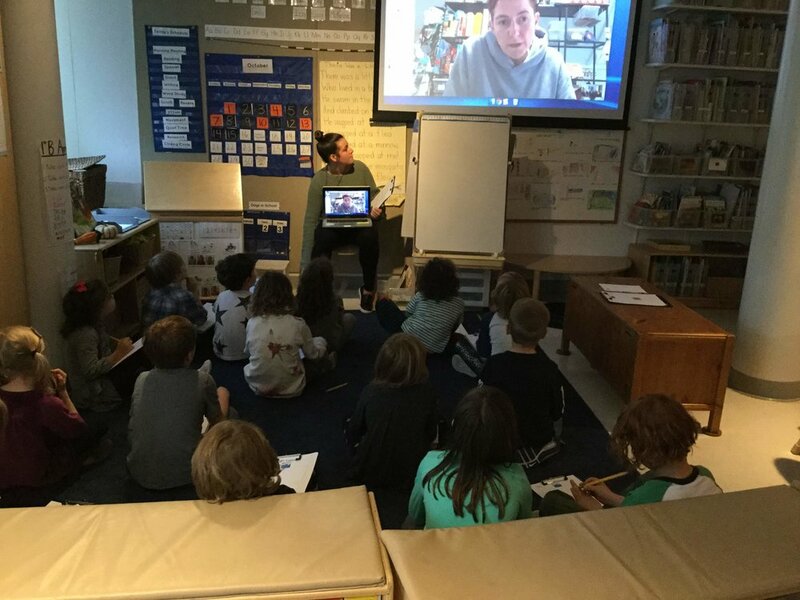 They then have the opportunity to have their questions answered during the in person or skype interviews. Emily and Lissy did some major leg work to get contacts and line up interviews for the children but expressed how generally excited professionals are to talk to the class about their work. Playgrounds aren’t all about playing. Thank you Emily and Lissy! Over the next several days, hopefully you get a chance to kickback, relax, and maybe even read a book or two that you have been saving for an occasion such as this. Blue School Librarian Laura Winnick has some special recommendations for all of you. 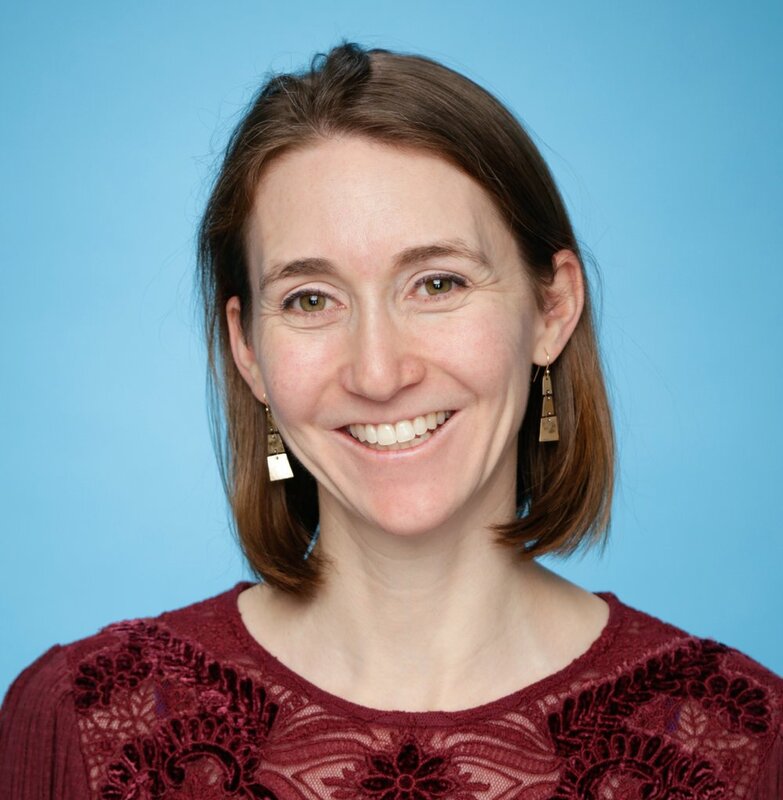 This is Laura’s first year with Blue School, and in her own words, “she has the best job ever!” She has helped curate and procure over 12,000 titles in the Blue School collection. Prior to coming to Blue School, Laura worked at a high school in Lower Manhattan teaching media literacy. It was in this role by happenstance that she met Middle School teacher, Caitlin Barry (check out the Community Corner on Caitlin and Amy!). 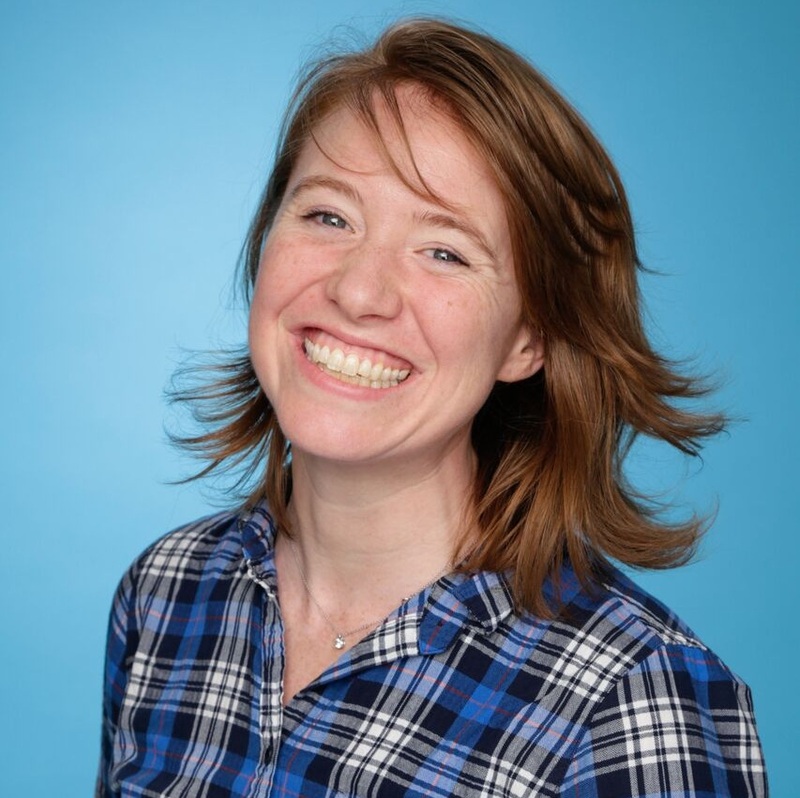 Laura sent a cold email to a listserv of educators, and Caitlin responded.The two shared interest around media literacy and project-based learning. Both teachers are a part of the National Association of Media Literacy in Education. It was Caitlin who told Laura about Blue School and its new Middle School Library opportunity, and the rest was history. Fast forward and the pair co-teach media literacy to the 6th grade, and have presented at the Northeast Media Literacy Conference. On top of that, she is a part of the Middle School Book Club. They did a lively piece on Harry Potter most recently. Laura’s reading list stays evergreen. 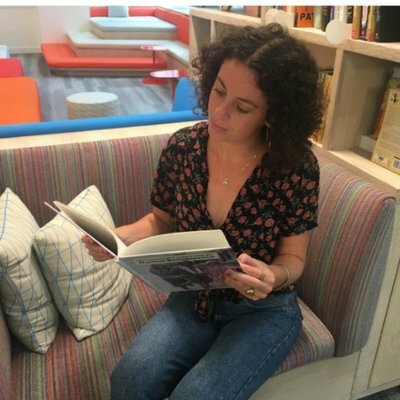 Outside of her work here at school, she writes for media outlets like Broadly, where she has shared her reading recommendations: [10 Best Books of 2018]. This also means she gets the awesome opportunity to preview some of the 2019 publications! Here are some middle grade/Young Adult titles that a young reader (or you!) might enjoy. Happy Winter Break Blue School Community. ¿Cómo se dice... Kindergarten is magical? In KB, the students (and teacher, Alexis Schmidt!) are learning words of the day - in Spanish! Amalia Velazquez’s love of teaching first came in the form of being a big sister to her younger siblings. Having grown up first in Mexico, Amalia’s first language is Spanish. At the age of 6, Amalia moved to the States with her family, and began to learn English at school. Through this lens, she is helping the KB students understand their language acquisition abilities. Inquisitive kindergarteners are excited to practice their budding Spanish skills, alongside Alexis. Part of the fun of learning is doing so together. Alexis credits her own early childhood experience with her love of the age group. Alexis attended a Montessori school in California, and in a full circle moment, accepted a job at that very same school right after college. She traces some of the habits that she practices to this day back to her awesome teachers. 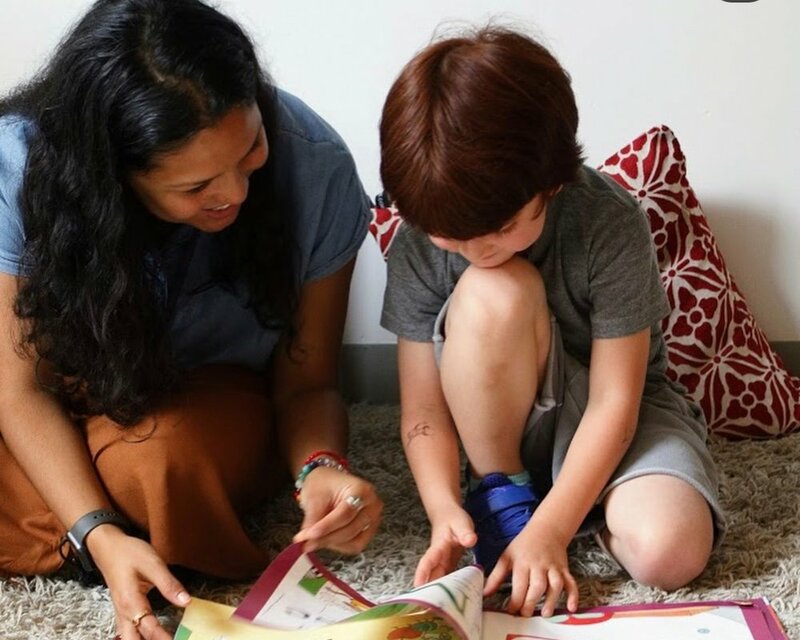 She started her teaching practice in a Kindergarten class, moved to teaching 3rd grade for a couple years, and finally, happily returned to her first love. 17 years later, Alexis still marvels at how funny, witty, creative and intuitive her Kindergarteners are. “What is a neighborhood?” is the question that sparked a sequence of exploration. The class’s neighborhood study has been a multi-pronged effort. The first step was to garner interviews with grownups about neighborhoods. The next phase involved walking tours around the Seaport, as well as a field trip to the Brooklyn Children’s Museum. Kindergarteners are defining and furthering their understanding of the components that make up a neighborhood. The results of which will be shared at the end of the school year. 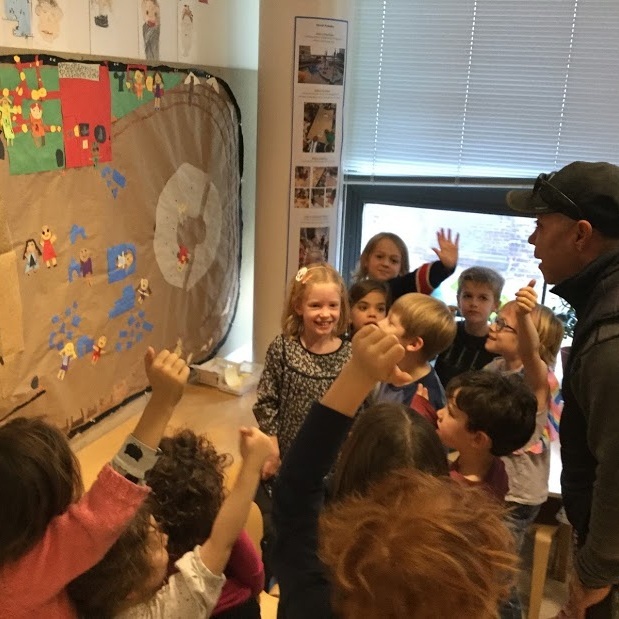 Alexis and Amalia effused that Kindergarten is one of the places where people learn life skills: learning to share, to interact with friends and, of course, to be kind. All of which we need more than ever. Moreover, both Amalia and Alexis have lots of fun together and with their class. The excitement and joy is contagious. Kindergarten is a really special place. Maybe even magical?! On the second floor across from the Commons are some of the youngest Blue Schoolers. Under the careful teaching tutelage of Jill Sobelman and Alex Kavo is the Pre-primary 3sB class. This is Jill’s second year at Blue School working in a classroom with Alex. Alex is in his third year teaching at Blue School, and is enjoying Pre-primary. Jill discovered her love for teaching when she first started working for a camp. Jill’s passion for Early Childhood education grew while at Bank Street College of Education. Similarly, Alex has been teaching for six years and will be completing his Master’s in Early Childhood in the Spring. Jill explained to me that for many of the 3s, this is their first experience with school and being in a classroom setting. They are spending the majority of their day at school and particularly in the class with her and Alex. Everything is new to them as they are acclimating to the daily schedule and being with friends. It really is an exciting new adventure to experience! From the early first days of school, Jill and Alex recognized that their class of 3s had a lot of energy. They loved to run - and move fast. 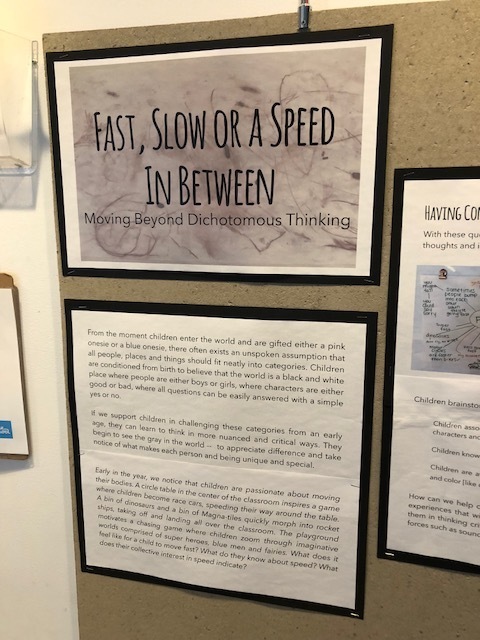 Working from the energy and inquiry of the children, Jill and Alex developed a study using the lens of both fast and slow. They wanted to challenge and incorporate their students’ curiosity. Paying special attention to the surroundings, they have implemented the neighborhood as a part of the study.The class has ventured out into the Seaport to observe the ships on the East River, and has experienced their own kinetic energy while painting vividly in the materials studio or making marble runs in the classroom. The ideas of ‘Slow and Fast’ have been incorporated in many ways of deliberately thinking and being. Students are starting to understand that ‘Slow and Fast’ are elements of being a person. They are eagerly recognizing speed in their own movement, as well as the world around them. The children are also inquisitive about it. They are applying what they know to problem solve, and they are thinking about the speeds in between. Just some sage 3-year-old wisdom for you. What does a style of Architecture, Music, Movies, Makeup and the likes of Edgar Allan Poe all have in common? Well, just ask the 7th graders. 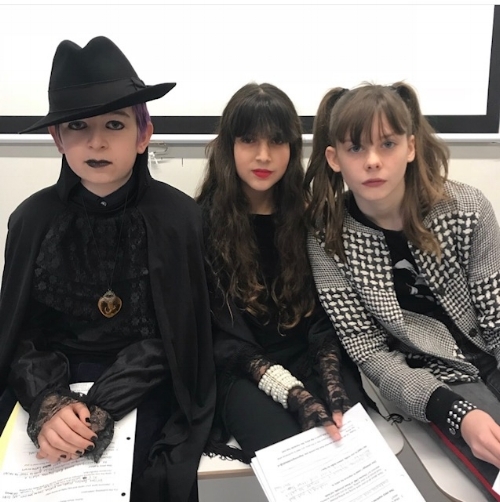 Last Monday, students held a gothic short story presentation and publishing celebration to cap off exploration of the genre. You might have seen some middle schoolers rocking intense eyeliner and bold black lipsticks as they were getting into character. Amy Zolla and Caitlin Barry, who both teach Middle School Novels and Nonfiction, explained to me the importance of remaining respectful while exploring the gothic identity. There is more to the gothic genre than being dark and creepy. Gothic wrestles with deep societal, political, and gender issues offering social commentary. The 7th grade was super excited about exploration and immersing themselves fully into the identity. The class read sophisticated pieces like The Veldt by Ray Bradbury and The Yellow Wallpaper by Charlotte Perkins Gilman, as well as a spread of the more contemporary thrillers. Caitlin explained that though the genre is a bit different from the work they did in 6th grade around personal narratives, in many ways it is still highly personal work that is reflected in the stories students create. Literature is not the only aspect of Gothic they explore. During this unit, the students did a walking tour to check out local Gothic architecture and some still life work with studio art teacher Rose Nestler. While the unit offers an array of new ideas and identity for students to delve into, Amy did discuss grappling with this genre and the canons lack of diverse authors. She mentioned the emergence of Gothic literature in non-traditional spaces and the inclusion of less represented voices. Outside of her Blue School work, Amy has also attended interdisciplinary Facing History professional developments. At the core of the work of Facing History is understanding the ability of ‘people to make choices and choices to make history’. I hope you had a chance to hear some of the Gothic Short stories! During the Gratitude parade on Tuesday, the Primary and Middle School students will promenade the usual route around Water and Front Street culminating in a lively school sing. While the parade has become a hallmark of the Fall Holiday break, I just learned of its reactionary history from Cynthia. Cynthia Bogdanovich, the 4th and 5th Grade Support teacher was here at Blue School in 2012 when the parade was born. In the wake of Superstorm Sandy, many Seaport businesses were flooded and severely damaged. “We were grateful to be open after the storm,” Cynthia recounted. By some parts luck, and some extremely hard work, classes were able to resume a week after the storm, while other businesses remained shuttered for months to come. The previously scheduled Halloween parade morphed into what we dubbed the Gratitude parade. The display of song and joy helped lift the morale of the neighborhood as it was in the midst of recovery. Six years removed, it still is an opportunity to share the exuberance within our school walls with the larger community. Over her 9 years at Blue School, Cynthia has seen the school’s growth and evolution. She recalls the early days at the Astor Street location, and then the settling into 241 Water. She is now located in the newest frontier, 156 William Street and has made her work space on the third floor a small oasis. 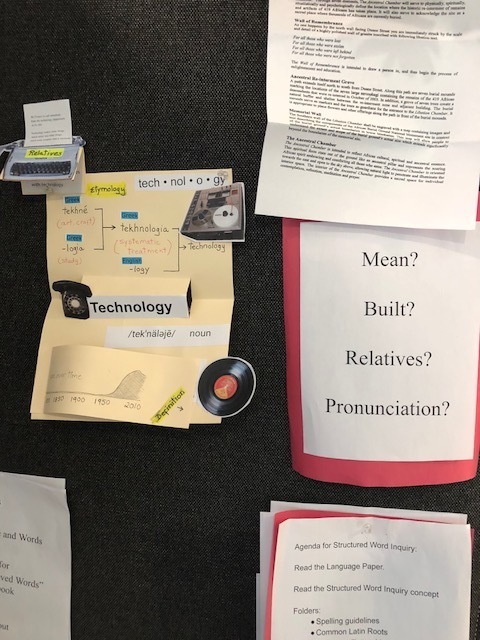 Cynthia has on display definitions and probing questions from her Orthography curriculum. Orthography, as I found out, is a deep study of words. A dictionary is a very unassuming book. The Fourth Grade will be leading the parade this year, displaying all they have learned in their Medieval Herbal studies. 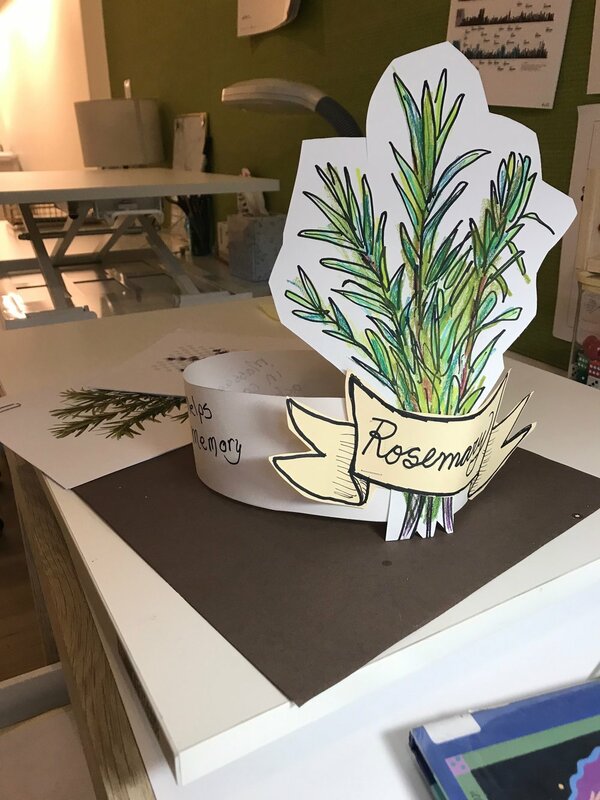 The children are making paper crown headpieces of the herbs they have studied and listing their benefits. Thank you, Cynthia, and see you at the Gratitude parade! Sometimes we hurry by places, never really taking notice of them. With the addition of the 156 William Street building, some new magical spaces have emerged in 241 Water Street. One of these is dedicated to the Dramatic Arts. This is where we can [often] find Rachel Evans. 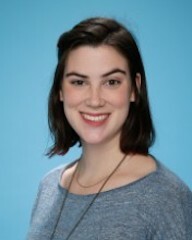 Rachel Evans is the Primary and Middle School Drama teacher. She has the opportunity to teach students from Kindergarten to Middle School. Now in her second year here at Blue School, she has a lot of exciting ideas for expanding on the foundations set last year. Rachel explained to me that all of her students start the school year learning about the importance of the ensemble: how to be one, and moreover, the importance of group work. The skills are differentiated by grade, tying in new rhetorical approaches. The dramatic arts curriculum isn’t limited to acting skills and practicing voice, rather, the students take on all roles of productions. Directing, acting, producing sets and costume design - the whole gamut. The work all comes together by the end of the year. For example, last year’s 2nd graders’ food study dovetailed into a production of Stone Soup, where the students took charge of it all. 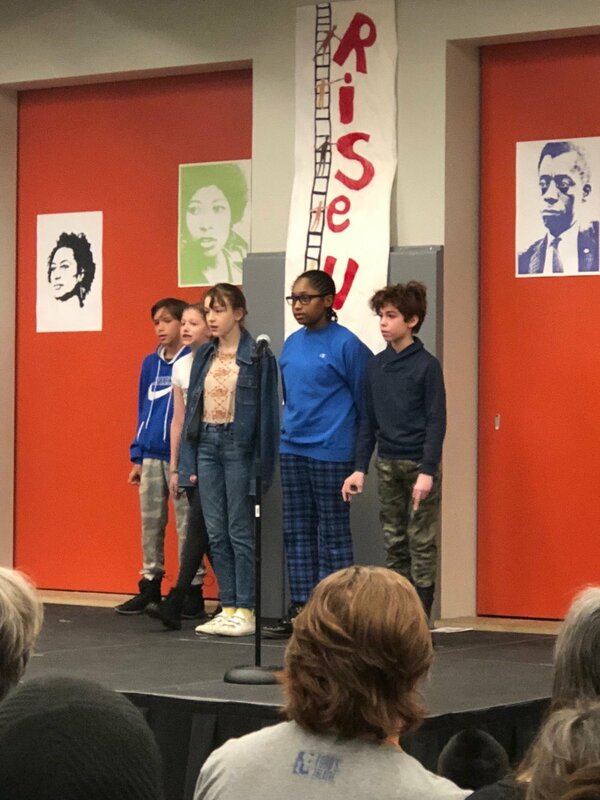 The 3rd graders did a dramatic interpretation of what it would be like to be an immigrant arriving to Ellis Island, related to their yearlong study. The students tapped into empathy and the emotions and experiences of the story to better understand the immigrant’s experience and make the scene come to life. When Rachel isn’t teaching classes, she is practicing her crafts as a producer, actress and writer. Most recently, she played the evil stepmother in a production of Cindy, a modern twist on Cinderella, and some Blue School families even had the chance to see her during the show’s run this past summer. 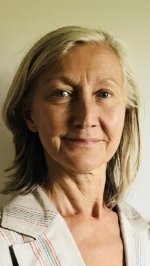 She has had a range of teaching residences, including working with students as young as three, as well as with senior citizens. An astute question from 8th graders poised to do some very timely voter registration work. Yes, they really can, and did! Blue School 8th graders hit the streets, quite literally, and were able to register an impressive sum of 29 voters in two outings. The dedicated group also gave up their recess to double the efforts. Corey Pickering reminded me that forgoing recess is a pretty big deal for almost any Middle Schooler. Corey, by the way, is a Middle School Integrated Studies Teacher. She invited a friend and activist to train the 8th graders on how to register voters. The process can seem a bit intrusive. Students grappled with questions about citizenship, as well as about the box on the form asking for the registrant to mark a gender. The process, questions, and even the nerves about approaching people were great fodder for discussion in collective. First, on the intersection of Fulton and William Streets, and then taking their talents a bit further to around City Hall, groups of middle schoolers held signs and clipboards to register. When their optimism was met by some melancholy, they stayed the course and reminded would-be voters about the importance of engagement despite affiliation. The registration work has been a culmination of some of the Middle School curriculum on civics, and expands on 6th and 7th grade themes of building community and action oriented service. Corey explained that students received a primer on the levels of overlapping government and started to see how the interconnected pieces support legislation that matters to them. While federal or state governments might appeal or uphold certain laws, cities, and even districts, also hold a degree of autonomy. All these elected positions means that voting, each and every time, can be impactful. The 8th graders will be doing an ethnographic assignment of what they see on Tuesday at their polling station. They will be taking special note of things like the wait time and the turn out. This is where we all can help them out. Tuesday, November 6th is Election Day. Participate. Thank you Corey! A special thank you and shout out to the 8th Grade advisors Caitlin and Rob for co-planning and leading this venture. When science meets service, we have a sustainability love story. 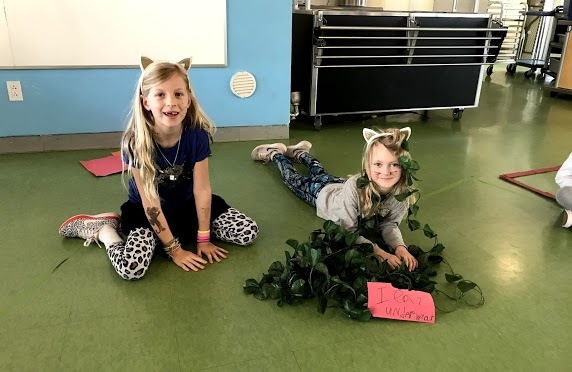 Last Friday, Carly Marcks, Science and Sustainability Specialist and Fifth Grade Teacher Carrie Klein brought students on a local expedition. Destination: Brooklyn Bridge Park. This was the first of four trips the class will take this school year to clean up discarded waste and collect scientific data. The sum of which is an intensive integrated study. Last year, Carly and Carrie took the fifth grade to Plum Beach twice to do a similar clean-up program. This year, they plan to stay a little closer to school and venture [by ferry] over to the park. The teachers are partnering with the Brooklyn Bridge Park Conservancy to facilitate the coastal clean-up project. The students are, of course, doing their part; rolling up their sleeves and collecting discrete data. The data that they have been collecting will be displayed graphically next week for all to see. The data collection sheet being used are from the Oceans Conservancy. The results reported and compiled throughout the world is aiding environmental scientists better understand what's in the oceans and what's washing up where. Check back in to see an update on their findings. 15,768,000 minutes, that’s one way to measure three years. Three years is about how long it took for Randall de Sève’s latest book to go from a concept to landing on bookshelves. For those who don’t know her; this is Randall’s second year at Blue School. Her first year was spent teaching the Parent Caregiver Two’s class. This year, she is working in the Admissions office as the newly minted Early Childhood Education and Outreach Specialist. Zola’s Elephant is also Randall’s 6th published book! For her part, the writing of the story takes about a year. Illustrations [by Pamela Zagarenski] took about another year to complete and the last year was mostly logistical, marketing and release promotion. Zola’s Elephant, dedicated to both her daughter and her daughter’s friend, is inspired somewhat by their real life relationship. The inception of the book idea was truly a family affair. An off the cuff comment from Randall’s husband about a large box being moved in by their neighbors spurned a very special story. The title character, Zola, is thought to have a pet Elephant. Randall is so excited to share both the story and the illustrations with children. There is a ‘beautiful confluence’ from which children can create their own stories. Both tucked away and in plain sight. The 6th Floor Art Studio is a dreamy space filled with abundant sunlight, trinkets, posters, and materials curated by Caroline. Hopefully you had a chance to see her piece on display at Governor’s Island during the All School picnic. For those who don’t know her; let me introduce Caroline McAuliffe. Caroline is a Primary Studio Art Specialist here and textile artist. She is in her 5th year and has a special appreciation for the growth of the Art program. Caroline had the unique opportunity to mold and inform the direction of the early STEAM curriculum. On top of that, she has supported a plethora of Blue School events and art auction projects with aesthetic input. It goes without saying that Caroline is deeply passionate about her work with the students. 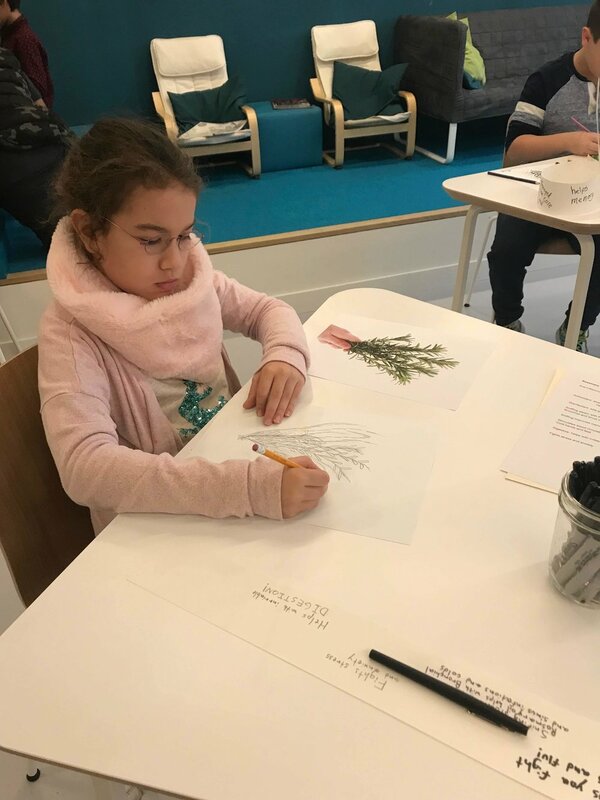 Recently, students from 1st through 5th grade all drew the same 4 plants as a part of a still life project. All of the drawings were vastly different. In part, the variations are due to the age and motor skills of the students but also as Caroline puts it “This is their brains on paper, this is how they see and we all have different perspectives in thought and in practice.” This is one of several creative processes she will lead her students through this school year. Outside of her classroom work, Caroline is making and displaying her own art. Her work was on display at the Governor’s Island Art Fair, and she is gearing up for a group show about contemporary textiles at Montclair Art Museum opening in February 2019.